New game, kiddies. While I put the finishing touches on my Horns 'n' Spikes wrap-up post, I thought I might start something. 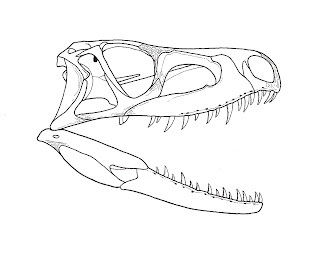 I'll post a skull I've restored, and you get to guess what (or who) it is. Couldn't be easier, right? We'll start with an obvious one to start things off. Not all skulls will be reconstructed. Sometimes, you'll only get bits and pieces. Hint: it is neither cute nor cuddly. Largely simplified from Paul (2002). BTW, if you tell me I'm right, Zach, I'll give you free cheese! Well, John, if you like your reptiles with big eye sockets and "little" teeth, you'll like something I have coming in the next few months hopefully.